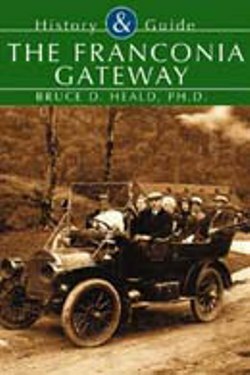 The Franconia Gateway, by Bruce D. Heald, Ph.D., 2002. A History & Guide to the Pemigewasset valley, including Plymouth, Campton, Thornton, Waterville Valley, Woodstock, Lincoln, Franconia Notch and Franconia. Text covers historical highlights and scenic attractions, including a chapter on the Old Man. Illustrated with nearly 150 vintage photos, illustrations and maps. 160 pp, 6 3/4" x 9 3/4".